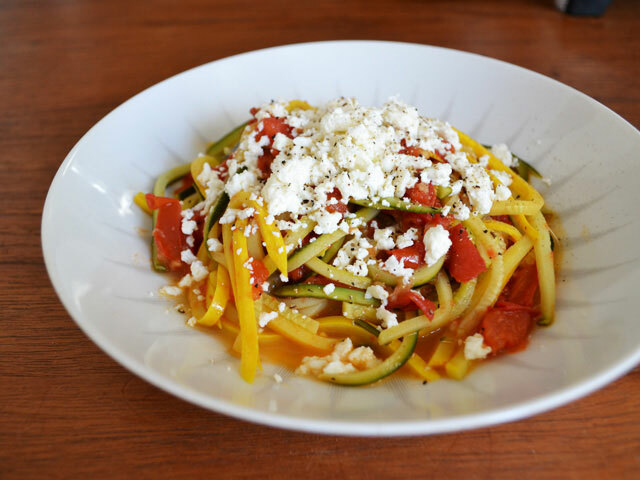 Seasonal Eats: Summer Squash for the Summer Season! It&apos;s officially summer, so let&apos;s start with something that&apos;s abundant all season: Zucchini! It is one of the many offspring of the ancestral summer squashes introduced by the Americas, spreading to temperate climates around the world to spawn the many varieties we see today. 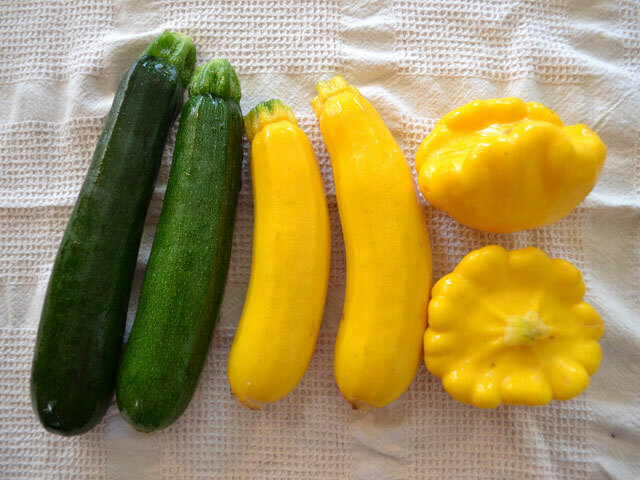 Though they can take on different shapes, most pattypan squashes grow and taste very similarly, so mix them up for some variety of color and shape! If you&apos;ve ever grown summer squash, you know they&apos;re utterly prolific, and maybe you also know you can eat the blossoms, which can cut down on production. If you find you want to preserve some, use this how-to on freezing zucchini or try out zucchini pickle. If you&apos;re including the skins, you&apos;ll be happy to know you&apos;re dealing with a good source of Protein, Vitamin A, Thiamin, Niacin, Phosphorous and Copper, and a very good source of dietary fiber, Vitamin C, Vitamin K, Riboflavin, Vitamin B6, Folate, Magnesium, Potassium and Manganese. Raw zucchini has a glycemic load of 2. Starting with fresh fare, summer squashes make great salad additions both cooked and raw. I like to slice it up and toss with feta, Kalamata olives, chopped tomato and cucumber for a crunchy chopped salad. Get out your mandoline and try ribboned zucchini salad, or this Italian shaved zucchini salad with parmesan pine nuts, or try a fresh zucchini carpaccio with ricotta cheese. For quick cooking, I&apos;ve often done a simple slice and steam, followed by a toss in a vinaigrette or lemon dressing with Parmesan. Some lovely zucchini soups include zucchini garlic soup and chilled zucchini soup with lemon-cumin shrimp and cilantro cream. Zucchini blossoms are delicate edibles that have both floral and squash flavors. It is recommended to carefully unfold the petals, reach in with your finger & thumb and pinch off the main pistil, as it can add bitter flavors to your food. I&apos;ve heard of dishes that batter and fry them, but they are so delicate I hardly think they need that sort of treatment. Instead, try sautéed baby zucchini with squash blossoms and lemon basil, or our oft-linked zucchini blossoms with vegetables. My favorite way is to stuff them with ricotta, but they also go well in any tortilla or frittata. Summer squash cook up quite nicely and take on sauces and dressings really well. Enjoy them in pastas such as pasta with zucchini, blossoms and caramelized onions or in this tangy fettuccine with zucchini, arugala, basil and lemon. One of my favorite ways to have them was my dad&apos;s specialty of halving them lengthwise, placing on the broiler and sprinking with grated parmesan, salt & pepper, broiling until the parmesan was lightly browned. An embellishment to that is this baked zucchini with pancetta. Or try out balsamic zucchini. While I&apos;m not big on frying, I can&apos;t ignore some of the tasty ideas I found. How about zucchini bacon fritters with basil mayo dipping sauce? Or do up some zucchini poppers with sour cream dip. Get Greek on it with kolokithokeftedes: Greek zucchini fritters with tzatziki, or put the potatoes aside and try out shoestring zucchini fries. Add zucchini to any grill party by slicing or cubing them and adding to any kebab skewer combination. Slice them thin and dress with a vinaigrette to grill to eat on their own, or as a preparation for salads, pizza toppings, sandwiches, or these charred corn and zucchini tacos. Halve them and try out grilled zucchini with parmesan and garlic chili oil. For fun in the oven, these savory zucchini, lemon and ricotta galettes look amazing, as does this zucchini, bacon and gruyere quiche. On the sweeter side of things, there is zucchini bread, but don&apos;t pass up the opportunity to try chocolate zucchini cake or these zucchini ginger cupcakes. Years ago, a good friend of mine told me she&apos;d been making pasta-cut zucchini and preparing it like spaghetti. Back then, she&apos;d use her favorite canned sauce and put some cut sausage with it for a quick and easy preparation. Recently I got a heavy-duty mandoline with a .125" julienne slice that makes this a snap. Chop your tomato over a plate to reserve the juice for cooking. Add the tomato and juice to a pan with the crushed garlic, oil and vinegar and simmer on medium-low heat. Toss to mix flavors and spread evenly over the surface of the pan to cook through, about 15 minutes. Add julienned zucchini to the pan and cover to steam through, 5 minutes. Toss to coat and cook just to reduce most remaining liquid a few minutes. Spoon into a pasta dish and top with the cheese of your choice, salt and pepper to taste. Serves 2.